In this special issue of Nova Religio four historians of medieval and early modern Christianities offer perspectives on basic conceptual frameworks widely employed in new religions studies, including modernization and secularization, radicalism/violent radicalization, and diversity/diversification. 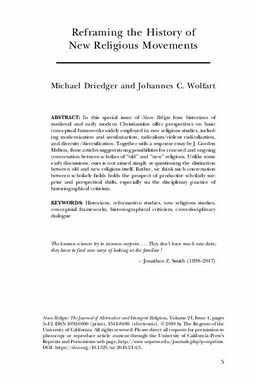 Together with a response essay by J. Gordon Melton, these articles suggest strong possibilities for renewed and ongoing conversation between scholars of "old" and "new" religions. Unlike some early discussions, ours is not aimed simply at questioning the distinction between old and new religions itself. Rather, we think such conversation between scholarly fields holds the prospect of productive scholarly surprise and perspectival shifts, especially via the disciplinary practice of historiographical criticism.